A little experiment with watercolor paints. It’s wintertime in Florida but the temps have been in the 70s & 80s. 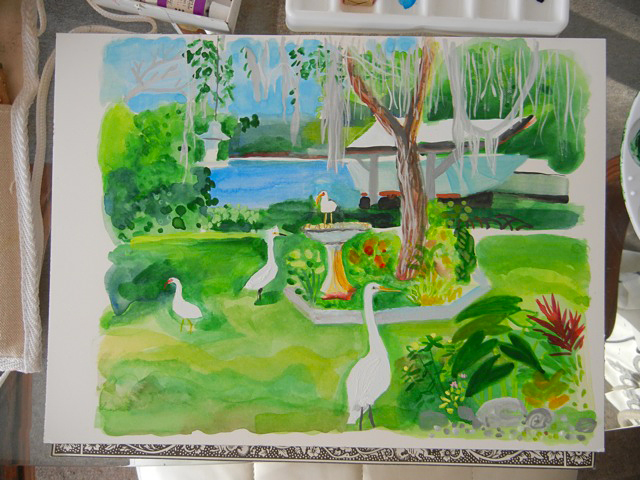 Just perfect for hangin’ out in the lanai and dabbling with watercolors as the egrets and ibises flit around the backyard in search of bugs and fresh water from the birdbath. Inspired by recently seeing George Clooney’s newest movie, The Descendants, I’ve downloaded the soundtrack consisting of all Hawaiian music that really creates a tropical mood. Today is New Years’ Eve and and warm enough to ride my bike over to the store to pick up champagne for later on. Happy New Year! 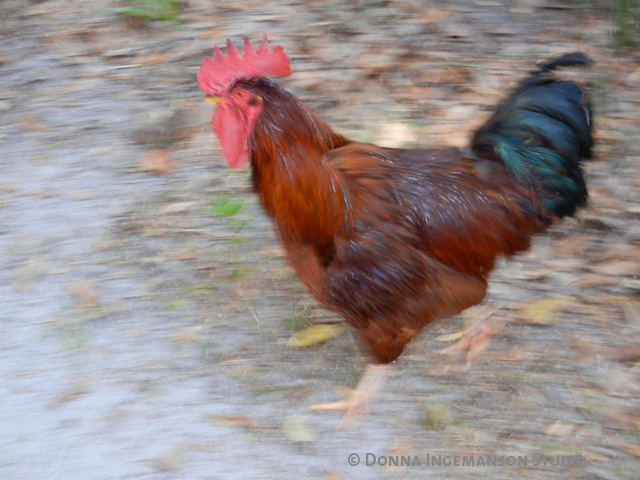 Rooster from Marjorie Kinnan Rawlings property. 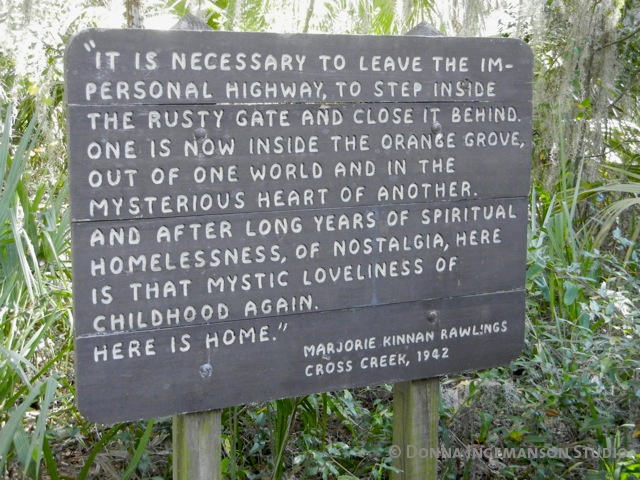 While traveling through Florida I had a chance to visit the Marjorie Kinnan Rawlings Historic State Park. Many moons ago I illustrated the covers for Cross Creek and Cross Creek Cookery which are both written by her and published by Simon & Schuster. 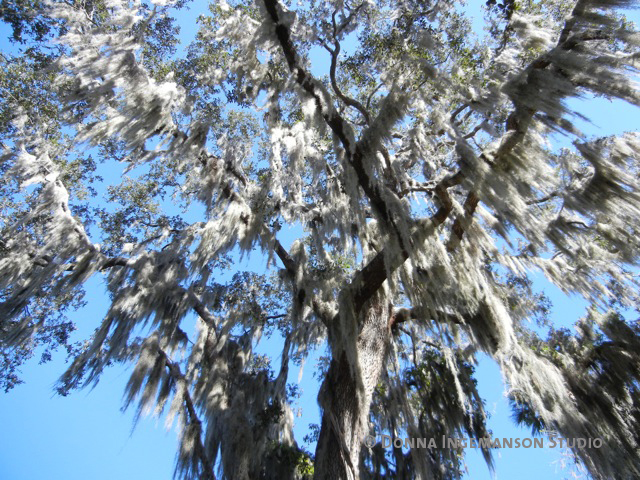 They’re classics and worth checking out if you love nature and Florida history. After closing a rusty gate on the Cross Creek property you'll encounter this sign. The Marjorie Kinnan Rawlings house and barn is well kept and tidy and exactly the way it was when she lived there. This park is well worth exploring. At the moment I’m reading the Pulitzer Prize winning book The Yearling and the story seems so much more tangible now that I’ve visited the site where it was actually written. Both the book and the park will transport you to another era that was much simpler and in tune with the natural world. 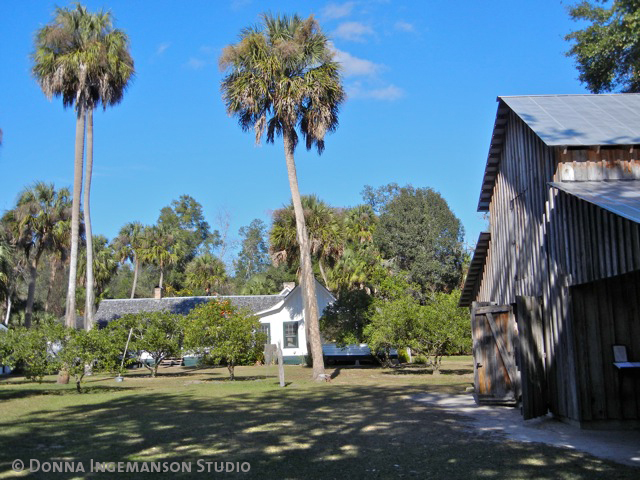 Marjorie Kinnan Rawlings farmhouse and barn at Cross Creek. Marjorie’s farmhouse and property is a living museum that depicts her lifestyle during the 25 years that she lived here starting in 1928. Every inch is painstakingly preserved with a farmhouse, barn, gardens, hiking trails and critters. You are currently reading aloha 2012… at donna ingemanson studio.